Minitokyo »	Kuroshitsuji Scans » Kuroshitsuji: PASH! What a group! 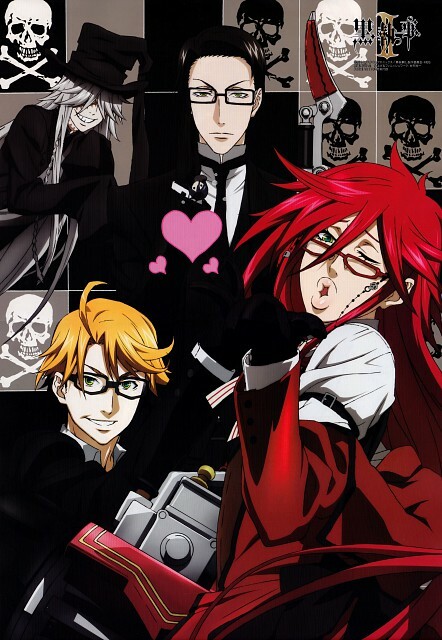 XD... has someone ever thought that Grell and Undertaker will be a great couple? XD. and Will with Sebas-chan, of course! jajaja... aaaah! Shinigamis are awesome xD... ! This is so awesome. Love all the Shinigamis. I love the fact that the Undertaker is the best Shinigami! He's awesome! I'll never forget the episode Det. Aberline was all official walking in and the Undertaker laughed HARDER than with Sebby-san! Thanks for sharing! Oh, William T.Spears is always in a serious mood. On the other hand, Grell always having fun in all situations. Thank you for the scan.